FRONT 4-Pot 286x26mm PB Brake Kit. PB Brake kits take stopping power to the next level! Everything required for installation is included in the kit, and no modification is required as each of our kits has been specifically designed for your vehicle. Unlike other brands in the same price range, we offer 8 different sizes of caliper to perfectly match each rotor diameter, and we refuse to offer oversized calipers on small rotors just to look good. PB kits are precision engineered, utilizing state of the art CNC technology and using only the finest materials. Our rotors are manufactured from high grade FC250 alloy with anti-rust coating. They utiilze large vents to dissipate heat more efficiently. Center caps are made from aerospace grade aluminium we hard anodizing electrolyte treatment for improved durability. Each rotor is manufactured to a tolerance of +/- 0.02mm to ensure perfect balancing. Any rotor that does not meet our high QC standards will not leave the factory. Calipers are made from high quality aluminium, squeeze forged, and finished with an anti-rust coating. They include internal oil and dust seals for protection against the elements. We offer 8 different sizes of caliper to suit each size of rotor. Calipers are available in 18 anodized or powder coated finishes (please see chart below). We also manufacture our own high quality street and race brake pads. They include heat plates to imporove heat dissipation and reduce noise. Coefficient of friction: 0.32-0.40. Coefficient of friction: 0.40-0.52. Each kit includes a set of DOT compliant stainless steel braided brake lines, with waterproof PVC coating. They are vehicle specific, so additional adaptors are required. The lines also have clips attached to make life easier when installing. Brackets are made from high strength steel alloy, manufactured specifically for each vehicle application. Again, no modification or adaptors required. Options (please add cost to total at checkout). Rotors are available in drilled, slotted, or drilled+slotted patterns for no extra cost. Selection of 18 anodized caliper colours to choose from. We are so confident of the quality and reliability of our products that we offer a one year guarantee on our calipers, and 6 months on our rotors. If there are any problems during that period, we will send out replacement parts asap. Please see terms and conditions for more information. 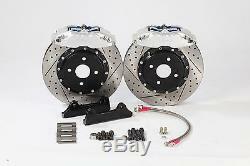 The item "Honda Civic EF EG EK EP FD K9 Type R Front 286mm 4-Pot PB Brakes Big Brake Kit" is in sale since Tuesday, June 18, 2013. This item is in the category "Vehicle Parts & Accessories\Car Parts\Brakes & Brake Parts\Brake Component Packages". The seller is "pb_brakes" and is located in Taichung.